The Compulsive Reader: Christmas Giveaway: The Christmas Magic and The Nutcracker and the Mouse King! 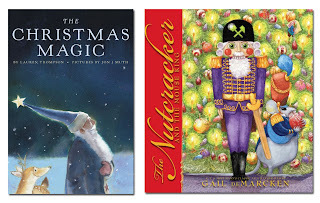 Christmas Giveaway: The Christmas Magic and The Nutcracker and the Mouse King! Christmas is coming up sooner than we think, and these two picture books are great for younger children and the whole family! On Christmas Eve, Godfather Drosselmeier has arrived with gifts of marvel and enchantment for his young godchildren. Goddaughter Marie falls in love a bewitching nutcracker doll and claims him as her own. Yet when the clock strikes midnight, something terribly amazing happens to Godfather’s handcrafted toys…they come alive. Marie is swept off her feet on an incredible journey with the Nutcracker in this astonishing classic story by E.T.A. Hoffman. Critically acclaimed artist Gail de Marcken’s stunning illustrations bring this spellbinding tale to life. Far, far North, when the nights are longest and the stars shine brightest, Santa begins to prepare for his big night of giving. He gathers his reindeer, feeds them parsnips and berries, and polishes his bells and his sled. Then lovingly, he chooses toys for every child in the world. For Santa loves them all, and he knows what each child at heart wants most. Then, with the thrum of magic that makes reindeers fly, he spreads the Christmas joy and warmth throughout the world--as he always has -- and always will until the end of time. From best-selling author Lauren Thomas, and Caldecott Honor Artist Jon J Muth. I'll be giving away two sets of each book to two lucky winners! All you must do is comment below for a chance to win! Sorry, US addresses only. The contest will run until December 1st! Good luck! Great idea! I'd love to enter. I love the nutcracker story so. I have collected the German nutrcrackers and I loved going to the ballet each year. Christmas Magic seems like the perfect story to read my nieces and nephews. What a lovely giveaway! I LOVE Christmas books! Thanks! Those books look adorable, enter me please! What a wonderful giveaway for this time of year. The illustrations looks beautiful. Thanks for the chance to win! I love Christmas books, we use to have a copy of "The Twelve Days of Christmas" and I love reading it all year long. And I adore the story of the Nutcracker. I would love to win these to share with my kids. Email is in profile. The Christmas Magic looks like a wonderfull book and the Nutcracker is such a classic sotry. This is a nice contest! I am very excited about The Christmas Magic book. Jon J. Muth is brilliant. Please enter me is this super terrific contest. My e-mail is kidzbkcrusader@aol.com. Thanks! I would love to add these to our growing Christmas collection! I love Christmas books and would love to win this! I would love these books for my two boys. I would love to win these books for my little girl. She would LOVE them! Thanks for the great giveaway. Anything with the Christmas spirit is fun, I love the idea and the givaway is so nice for the everyone because it reminds us that Christmas is really about each other and sharing.